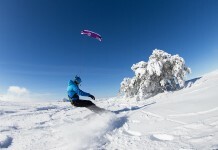 The Bighorn Snowkite Summit for the 2014/15 season was held the week of December 1st-7th 2014. 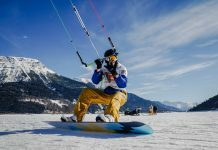 The less structured approach this year allowed amateurs and professionals from all companies and organizations to speak freely about their opinions and the direction of snowkiting. The conditions were great, with plenty of snow and wind every day. 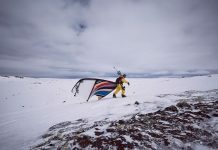 It was noted that more and more riders are choosing to fly or “glide” with their kites and that became a main topic of discussion. As our sport moves forward it seems like the “flying” aspect is here to stay despite safety concerns from some and even outright opposition from others. The move forward is to encourage our community to grow and share experience so that we can pass techniques and safety to our friends. Flying low and controlled with newly inspected equipment and redundant systems is the “safe” strategy for flying.